D Pullanikkatil, PJ Mograbi, L Palamuleni, T Ruhiiga, C Shackleton. (2018). Unsustainable trade-offs: provisioning ecosystem services in rapidly changing Likangala River catchment in southern Malawi. Environment, Development and Sustainability, 1-20. Maseko, H., Shackleton, C., Nagoli, J. and Pullanikkatil, D. (2017) Wild foods in children’s diets across a deforestation gradient; a case study from southern Malawi. Human Ecology. 45:6. Pullanikkatil D., Palamuleni P. and Ruhiiga T. (2016). 'Assessment of land use change in Likangala River catchment, Malawi: A remote sensing and DPSIR approach'. Applied Geography, Volume 71: 9–23. Pullanikkatil, D., Palamuleni, L.G. & Ruhiiga, T.M (2015). Impact of land use on water quality in the Likangala catchment, southern Malawi, African Journal of Aquatic Science, 40:3, 277-286. Matarira,C., Pullanikkatil,D., Kaseke,T., Manatsa,D., Shava,E. (2013) “Socio-Economic impacts of climate change on subsistence communities: Some observations from Lesotho”, International Journal of Climate Change Strategies and Management, Vol. 5 Iss: 4, pp.404 – 417. Pullanikkatil, D. and Urama, K.C. (2011). The effects of industrialisation on water quality and livelihoods in Lesotho, International . Journal of Environmental Engineering, Vol. 3, No. 2, pp.175–191. Pullanikkatil, D., Kaneka, B., Mkanthama, C., Pemba, D. and Chiotha, S. (2018). Public health and population: Linkages with climate variability. In "Socio-Ecological Resilience to Climate Change in a Fragile Ecosystem: The Case of the Lake Chilwa Basin, Malawi" Edited BySosten Chiotha, Daniel Jamu, Joseph Nagoli, Patrick Likongwe, Tembo Chanyenga. Routledge, London. Sambo E and Pullanikkatil, D. (2011) ‘Policy Analysis and Options for Actions’, Book Chapter in Malawi State of Environment and Outlook Report(2010). Environmental Affairs Department, Lilongwe. 1. “Creating linkages between reproductive health, population, gender and climate change; case study of Lake Chilwa Basin, Southern Malawi”, implemented by LEAD Southern and Eastern Africa, funded by Population Action International, USA. 2012. 2. Interview about role of LEAD in Rural Energy Kiosk Project, funded by Scottish Government, implemented by Renew N Able Malawi. 2013. Pullanikkatil, D. and Shackleton, C. 2018. 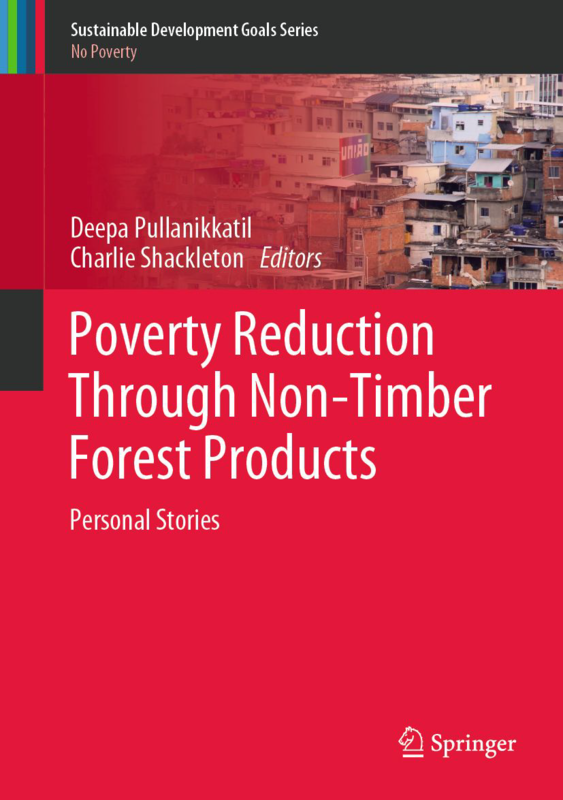 Reducing Poverty using Non-Timber Forest Products; Personal Stories. Springer Nature. Chiotha, S., Pullanikkatil, D., Chipeta, C., Mvula, P., Phalira, W., Mphepo, G., Mkanthama, C.(2013). Malawi’s Progress towards Achieving Sustainable Development Goals 20 Years Since the 1992 Earth Summit in Rio Stocktaking Report on Rio+20, LEADSEA Publications, Zomba. Pullanikkatil D., Kaneka B., Phalira W., Mkanthama C., Chiotha S. (2013). Linkages between Population, Reproductive Health, Gender and Climate Change Adaptation in Malawi, LEADSEA Publications, Zomba, Malawi. Pullanikkatil, D. and Chilambo, M. (2011) ‘Bird Activity Book: For Wildlife Clubs of Malawi’, Wildlife and Environmental Society of Malawi, Zomba. Pullanikkatil,D. (2008) ‘Land use mapping and transboundary water quality assessment of Caledon river’. University of Free State, Bloemfontein, South Africa. 1. "How harvesting natural products can help rural people beat poverty". 2019. The Conversation. 2. "North-South research partnerships must break old patterns for real change". 2018. The Conversation. 3. "Beating poverty needs partnerships and collaboration, not just money". 2018. The Conversation. 4. "Ten life lessons from doing a PhD at "PhD Talk"
6. “Great Lakes of Africa; from Problems to Solutions”, Rozenberg Quarterly. 2017. 7. “Ubuntu and Natural Resources Management; some reflections”, Rozenberg Quarterly. 2017. 8. “Deepa Pullanikkatil: Climate Adaptation Efforts Reveal Health-Environment Links in Malawi”, News Security Beat, Woodrow Wilson Center, Washington DC. 2014. 9. “Why is sustainable management of oceans, forests and biodiversity a population issue?” On the Population Action International Website. 2014. 10. “From Victoria to Chilwa: Integrated Development in Two African Lake Basins”, Woodrow Wilson Center, Washington DC. 2014. 11. “PAI partners talk on sustainable development”. 2014. 12. “What leadership is necessary for the water sector to develop sustainably?” 2014.